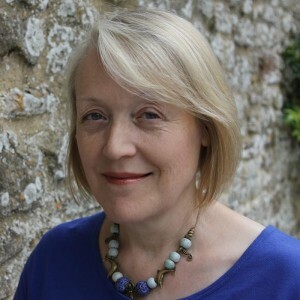 Today I have the pleasure of interviewing Katherine Langrish, author of a number of wonderful fantasy novels for older children, who has just released her new book–a collection of essays on fairy tale. 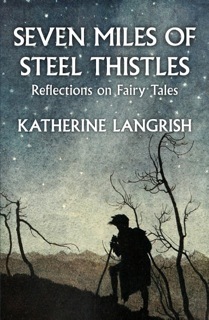 Your new book, Seven Miles of Steel Thistles, has just been published by Greystones Press, and unlike your other books, it’s a work of non-fiction: but like your other books, it shares a common element–a fascination with fairy tale and folklore. Why are you so interested in them? Quite simply, I’ve loved fairy tales and folklore ever since I was a child. I’ve never understood why some people feel it’s a taste adults ought to grow out of, unless perhaps the only fairy tales they’ve encountered have been the simplest versions retold for very little children. Fairy tales can be profound and as inexplicable as poetry. As I discuss in the book, a story like the Grimms’ tale ‘The Juniper Tree’ deals with enormous themes – murder, jealousy and abuse as well as birth, resurrection, and joyful communion with the natural world. It will ‘mean’ something slightly different to everyone who reads or hears it, because it elicits from each person their own emotional and spiritual response. In fact, this story was probably rewritten by a German romantic poet, but that’s the other fascination of fairy tales. They don’t ‘belong’ to anyone, they’re anonymous, so they adapt to the voice of whoever’s telling the story. And they’re so old! People have been telling stories like these for centuries. It’s such a large topic–did you try to pursue a particular line of inquiry or reflection in the book, or is it more organic? And what challenges and pleasures did you find in putting together the collection? Many of the essays in the book began life on my blog (see below), although for this collection they were massively rewritten and extended. I did not think I had chosen any specific line of enquiry, but to my own fascination I found as I went through the rewrites that a theme was in fact emerging: that of ‘authenticity’. What does, what can that mean in terms of traditional tales? Is the ‘earliest’ version of a particular tale ‘more authentic’ than a later one? My conclusion was, repeatedly, that while it can be fascinating to trace the history and analogues of a tale, it renews itself on the lips of the latest storyteller. Did any particular fairy tale or folklore scholars influence you in terms of interpretation and reflection? There are so many wonderful fairy tale and folklore scholars, an embarrassment of riches, but I have to mention the great Katherine Briggs, whose four volume ‘Dictionary of British Folk-Tales’ is a Bible in the field, and whose other books of fairy lore I love – such as ‘The Anatomy of Puck’ and ‘The Vanishing People’. I like her insistence on the primacy of narrative. I also love Max Lüthi’s ‘The European Folk Tale’ which so clearly illuminates the form and content of the classic European fairy tale. Most of the interpretations and reflections in ‘Seven Miles of Steel Thistles’ are my own, however – if only because I read the stories long before I read any of the scholars. You’ve maintained a blog with the same name as the book, over several years. It’s a wonderful title. Where does it come from, and was the blog a bit of a testing-ground for the book? The title of both the book and the blog comes from an old Irish fairy tale, ‘The King Who Had Twelve Sons’. In it, the hero has to ride ‘over seven miles of hill on fire, and seven miles of steel thistles, and seven miles of sea’. I love it as a metaphor for overcoming life’s difficulties, including the sometimes endless-seeming struggle to write well. I suppose the blog has become a testing-ground for the book, though I never expected a book to come of it. I began the blog simply as a place where I could write about the things I love – children’s literature, fantasy, fairy tales and folk-lore – and where I could talk with others who love them too. Does it sound too fey a comparison, if I say that the blog turned into a fairy garden and the book has grown up out of it like a tree? Do you have particular favourites in terms of fairy tales? If so, which–and why? I do – and I’ve written about some of them in the book. 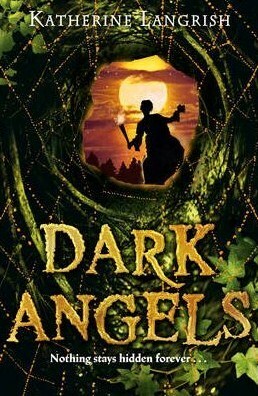 I’ve already mentioned ‘The Juniper Tree’, and I also love ‘Briar Rose’ and ‘Jorinda and Joringel’. But the story I love best to tell aloud is the English fairy tale ‘Mr Fox’, a very old version of Bluebeard with a far more intelligent and courageous heroine. What are your favourite folkloric creatures? My absolute favourites are the household fairies – the brownies, nisses, tomtes and domovoys which live with human beings and help (and sometimes hinder) them. I’ve written about then in several of my books for children: they’re an independent, mischievous, yet devoted race. They offer their services freely and will stay for so long as they are treated with respect and a dish of cream or oatmeal is left out for them on the hearth. I love the way stories about them mingle Otherness with domesticity. And I think they’re very, very old – as old as the story of Rachel in Genesis, who steals the household gods from her father Laban. Your novels and short stories borrow from several different cultural traditions–can you tell us a little about that? I began with Scandinavian folk-tales about trolls. I’d been trying to write a story about a young Viking boy which involved him encountering some of the Norse gods. The story just went completely dead on me – I couldn’t find the way forward at all. If a god befriends your character, why shouldn’t everything go smoothly for him or her? It seemed to me I was having to find complicated explanations for my hero’s predicaments. 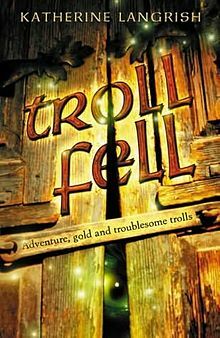 Then I began reading folk tales about trolls, and realised the book ought to be about them. I got rid of the gods entirely as an unwanted extra supernatural level, and the book – ‘Troll Fell’ – worked much better as a fairy tale rather than a fantasy. In books such as Dark Angels and the Troll trilogy you explore the worlds of what might be called ‘the hidden people’ and their interactions with humans. The idea of a ‘hidden people’ with a wide range of magical powers (from large to small) and alien intelligence but with many similarities to humans and who appear to be drawn to us–if only to exploit us at times–is part of the traditional folklore and stories of many cultures right across the world. Why do you think this is such a universal notion? Wow, that’s a huge question… and yet maybe it’s a small one too. Haven’t we all had the experience of laying something down and then minutes later not being able to find it? It’s so, so frustrating: ‘It has to be there! I know perfectly well I put it there, just before the phone rang! And now I’ve looked everywhere – and it’s gone!’ The temptation is to blame borrowers, or gremlins, which we know is a joke – but it still makes us feel better to be able to focus the frustration on some invisible, tricksy thing that’s sitting there laughing at us. Maybe it’s a human trait to imagine the universe as personal rather than impersonal. We can deal with the personal, we can understand it and negotiate with it – we humans are very good at that. Such feelings must have been far, far stronger in the past, before science began coming up with ‘rational’ explanations for everything. Incidentally, just where have I put my keys? You have been a storyteller as well as a writer. How does that influence your fiction? I began story-telling years ago when I lived in France and our children were small. I joined a a weekly English-language story session at the Bibliotheque de Fontainebleau for children aged three years and up. It can be quite hard to keep the attention of a group of fifteen to twenty little ones when reading from a picture book: you’re facing them, and you have to keep stopping and turning the book around so they can see the pictures, and that interrupts the flow. An inspirational friend suggested that we all tried telling stories ‘from the heart’ instead of reading aloud. I loved it. I found you could keep the children’s attention better and they make the pictures in their heads. I continued to tell stories to older groups of children for many years, and learned a lot about pacing a story, about narrative structure, and about the kinds of things children enjoyed – what got them excited, what made them laugh. So yes, I think it really did help my writing, which loosened up and at the same time became more confident. I just – love telling stories.